Acer tried to do something a little different when it took to the stage at CES 2012, using the final part of its press conference to drop a 'one more thing' moment. 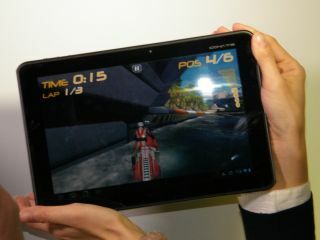 Its one more thing was the Acer Iconia Tab A700, a tablet which comes packing Ice Cream Sandwich and a huge quad-core processor. As Acer didn't officially release the tablet, details about its specs are scant but we did managed to get some hands on time with the device and got a pretty good idea how it performs. The first thing you notice about the Acer Iconia Tab A700 is the screen. It is bright and clear and this is because it has managed to cram a pixel count of 1925 x 1200 pixels on to the screen. Not only does this mean 1080p playback, it also gives things like text and magazines a little more zing. While the tablet doesn't actually have IPS, Acer is claiming that it using technology similar to it and we tried to look at the screen from every conceivable angle and were impressed by the clarity. Now, The Iconia Tab isn't going to win anything for looks. It is typical Acer fare, functional with a small hint of style. It's not the thinnest tablet we have seen, either – it clocks in at 9.8mm but it is packing a chunk of power and is a lot lighter than we were expecting. When it comes to the OS, we have a soft spot for Ice Cream Sandwich and usually get annoyed with any sort of skin, but Acer seemed to have added a few subtle changes which didn't hurt our overall experience with the tablet. It has decided to add its Acer Ring widget to the mix, which is accessible from the lock screen and there were a number of other apps which could be customised. Even with a skin, though, the tablet didn't seem to slow down at all. This must be down to the 1.3Ghz quad-core Tegra 3 processor, which matches the might of the Asus Transformer Prime. Another feature we couldn't try out fully was the battery but Acer have managed to add a 9,800 mAh battery to the tablet, so this is one device for the long haul. As we said we weren't enamoured by the design of the tablet but the back was stylish and Acer has managed to cover up ugly ports with a side cover – flip this and you have the likes of a micro USB and microHDMI. There's also a back-facing 5MP camera on board so you can Skype and the like to your heart's content. With the Acer Iconia Tab A700, it feels like Acer has raised its own bar and created a tablet of real substance, even if it lacks a little style.